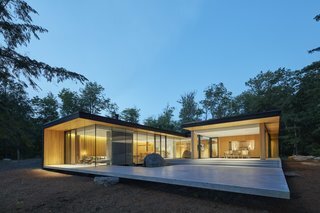 A family wanted to prioritize outdoor living and easy social gatherings in their new home—so Toronto firm MJMA delivered a "Canadian cottage where Frank Sinatra might like to hang out." 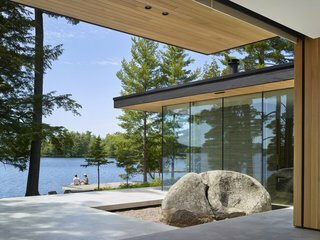 MJMA sought to let the 2,746-square-foot home "cascade and hover over the grade, to blend with the landscape, and to have a quiet presence from the water," so they arranged low-lying rectangular volumes around an exterior courtyard facing Manitouwabing Lake. Then they wove in extensive glazing that allows residents to access the peaceful surroundings from inside. 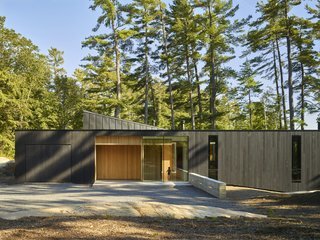 The dark exterior wood cladding ensures the home blends more seamlessly with the site, while the flat roof is meant to recall "midcentury precedents," said the architects. The "sharkfin clerestory roof" feature transmits light into interior rooms. 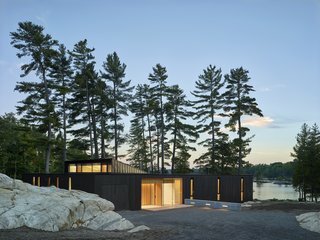 The low-lying home, completed in 2018, sits behind a stand of pine trees just steps from the water. The rear courtyard appears to float over the site. On the right is a large screened porch with three walls of retractable insect screens from Phantom Screens, which make it easy to use the space whether it's bug season or not. Large boulders are given pride of place in the central courtyard. 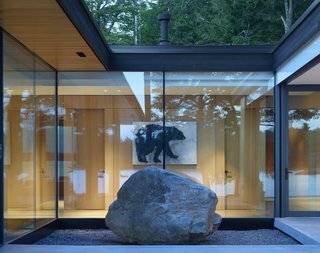 The house is oriented to utilize passive heating and cooling strategies. "Deep overhangs and large glazed areas on the south and west were modeled to protect from solar build up in summer and allow for heating gains in winter," said the architects. 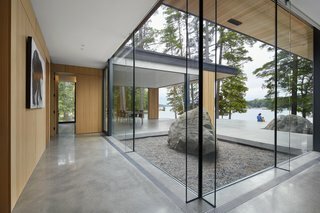 The frames around the glass were kept minimal so as to put the attention on the outdoors. The polished concrete flooring inside merges easily with the courtyard to encourage a sense of indoor/outdoor flow. Radiant floor heating, a high-efficiency boiler, a heat recovery ventilator, and a convection wood stove work to conserve energy. 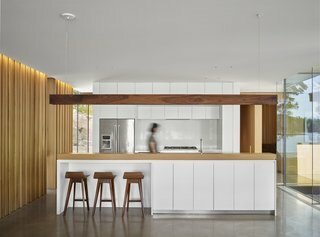 The kitchen scheme features banks of white, flat-front cabinets for serene contrast with the wood palette. 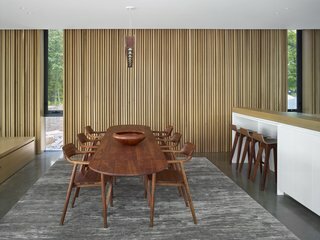 The custom pendant light over the dining room table was made by Lighting Nelson & Garrett. 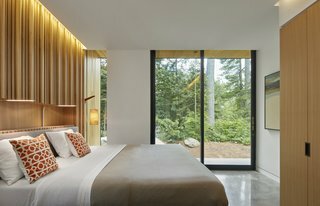 The wood wall cladding continues into the bedrooms, which remain private while also accessing the outdoors.